1. Preheat oven to 450°. Bake shells as directed; cool. 2. Place sweetbreads in skillet; cover with water. Bring to boiling; reduce heat; simmer 3 minutes. Cool immediately in cold water. Remove membrane and veins. 3. In bottom of 2-quart, shallow baking dish, combine carrots, onions, parsley, thyme, and bay leaves. 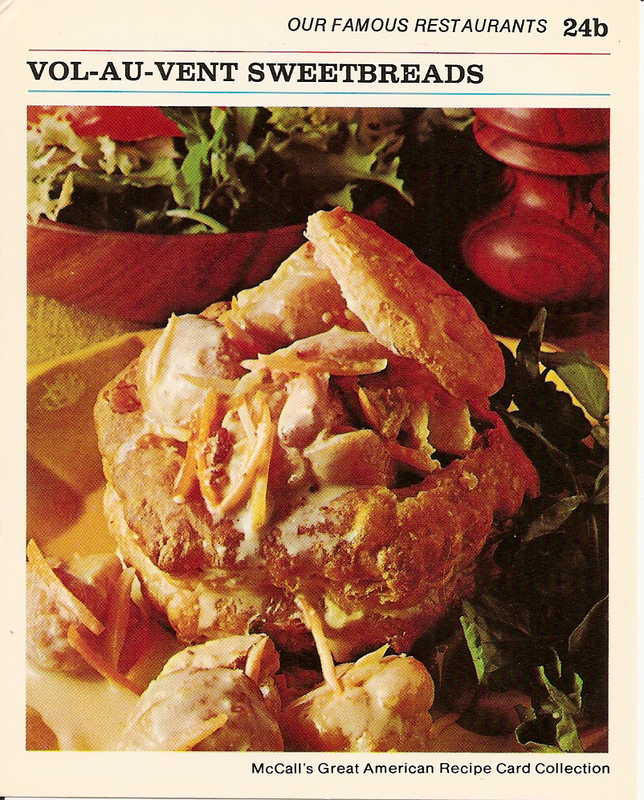 Arrange sweetbreads on top. Sprinkle with oil and salt. Bake, uncovered, 35 minutes. Remove sweetbreads; cool slightly. In hot butter in skillet, over medium heat, sauté sweetbreads 2 minutes on each side. Add peels. 4. In ladle, heat Grand Marnier slightly. Ignite; pour over sweetbreads. When flame dies, add juices. 5. Cook, stirring, to reduce liquid to one-half. Combine flour with heavy cream; stir into liquid. Simmer 5 minutes, stirring. Serve in warm shells. Recipe card notes that this recipe originally came from The Rainbow Room in New York.